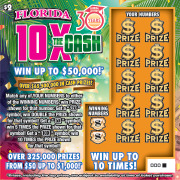 Florida Lottery Scratch-Off games are fun to play, and best of all, they give you a chance to win lots of cash instantly! 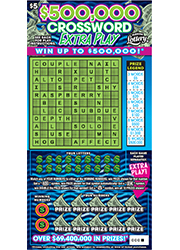 Scratch-Off games offer top prizes ranging from $50 to more than $1 million, with many other prize levels on each ticket, too. With our wide variety of games to choose from, you could play a different game every day. Read and follow play instructions on ticket. 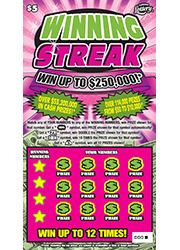 Scratch off the scratch-off coating on your ticket to see if you have won! 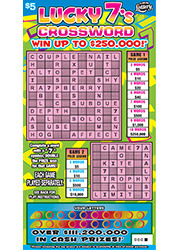 Scratch-Off games are easy to play. 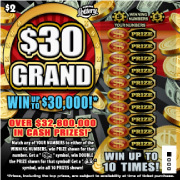 Just scratch the scratch-off coating on your ticket with a coin to see if you have won. Game instructions are printed on the face of your ticket. 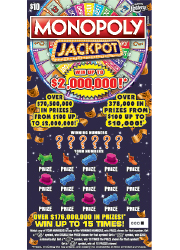 Each of the Scratch-Off games will vary in price, prize structure, play style, and play instructions. Match any of YOUR NUMBERS to the WINNING NUMBER, win PRIZE shown for that number. Get a "3X" symbol, win TRIPLE the PRIZE shown for that symbol! PLEASE NOTE: Prizes, including the top prizes, may be unavailable at time of ticket purchase due to prior sale or other causes occurring in the normal course of business. Every effort has been made to ensure the information provided above is accurate. However, in the event of an error, the game rules shall be controlling. Get a "STACK OF BILLS" symbol in the PLAY AREA, win PRIZE shown for that symbol. Get a "STAR" symbol, win all 6 PRIZES shown! Match any of YOUR NUMBERS to the WINNING NUMBER, win PRIZE shown for that number. Get a "5X" symbol, win 5 TIMES the PRIZE shown for that symbol! Get a "MONEYBAG" symbol, win all 5 PRIZES shown! 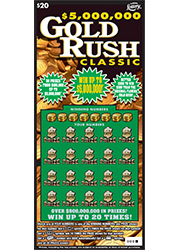 Enter your non-winning GOLD RUSH CLASSIC Scratch-Off tickets in the Gold Rush Classic Second Chance Promotion. 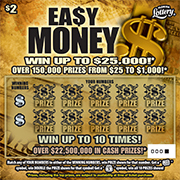 A total of 222 winners will win $600,000 in second chance cash prizes! 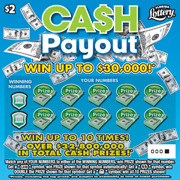 Six drawings will be held between January 30, 2019 and April 10, 2019, where one player in each drawing will win $30,000 in cash, two players will win $10,000 in cash, four players will win $5,000 in cash and thirty players will win $1,000 in cash prizes. 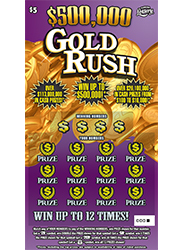 Receive up to 20 entries per ticket for a chance to win cash prizes of up to $30,000 by entering your non-winning GOLD RUSH CLASSIC tickets into the Gold Rush Classic Second Chance Promotion. Number of entries differs by game. Match any of YOUR NUMBERS to the WINNING NUMBER, win PRIZE shown for that number. Get a "STACK OF COINS" symbol, win DOUBLE the PRIZE shown for that symbol. Get a "GOLD BAR" symbol, win all 5 PRIZES shown! 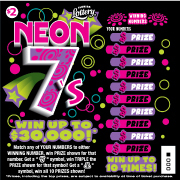 Match any of YOUR NUMBERS or the BONUS NUMBER to the WINNING NUMBER, win PRIZE shown for that number. Get an "ORNAMENT" symbol, win 3 TIMES the PRIZE shown for that symbol! 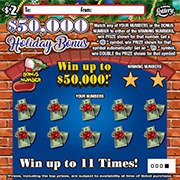 Enter your non-winning HOLIDAY BONUS Scratch-Off tickets in the $10,000 Holiday Bonus Second Chance Promotion. 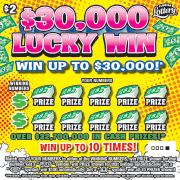 A total of 135 winners will win $300,000 in second chance cash prizes! Three drawings will be held between November 21, 2018 and January 2, 2019, where three players in each drawing will win $10,000 in cash, seven players will win $5,000 in cash and thirty-five players will win $1,000 in cash prizes. 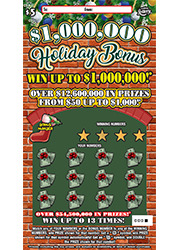 Receive up to 10 entries per ticket for a chance to win cash prizes of up to $10,000 by entering your non-winning HOLIDAY BONUS tickets into the $10,000 Holiday Bonus Second Chance Promotion. Number of entries differs by game. Match any of YOUR NUMBERS to the WINNING NUMBER, win PRIZE shown for that number. Get a "T COIN" symbol, win DOUBLE the PRIZE shown for that symbol! Get a "H COIN" symbol, win all 5 PRIZES shown! Get three like numbers in the same row, column, or diagonal line and win PRIZE shown. Get three "7" symbols in the same row, column, or diagonal line and win TRIPLE the PRIZE shown! Match any of YOUR NUMBERS to the WINNING NUMBER, win PRIZE shown for that number. Get a "MR. MONOPOLY" symbol, win DOUBLE the PRIZE shown for that symbol! Get a "MONEYBAG" symbol, win all 5 PRIZES shown! 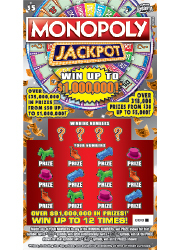 Enter your non-winning MONOPOLY JACKPOT Scratch-Off tickets in the PASS GO, COLLECT $20,000 Second Chance Promotion. A total of 144 winners will win $300,000 in cash prizes! 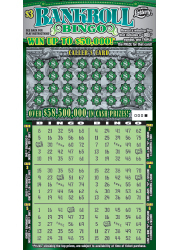 Four drawings will be held between July 25 and September 26, 2018, where one player in each drawing will win $20,000 in cash, five players will win $5,000 in cash and thirty players will win $1,000 in cash. 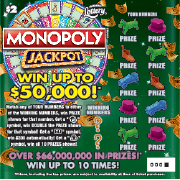 Receive up to 20 entries per ticket for a chance to win cash prizes of up to $20,000 by entering your non-winning MONOPOLY JACKPOT tickets into the PASS GO, COLLECT $20,000 Second Chance Promotion. Number of entries differs by game. 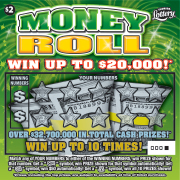 If the TOTAL of any ROLL equals 7 or 11, win PRIZE shown for that ROLL. Get a "TWO DICE" symbol, win DOUBLE the PRIZE shown for that symbol! Get a "WIN!" symbol, win all four PRIZES shown! Match any of YOUR NUMBERS to the WINNING NUMBER, win PRIZE shown for that number. Get a "2X" symbol, win DOUBLE the PRIZE shown for that symbol! Get a "$100 BURST" symbol, win $100 automatically! Get a "MONEYBAG" symbol, win all 5 PRIZES shown! Match any of YOUR NUMBERS to the WINNING NUMBER, win PRIZE shown for that number. Get a "5X" symbol, win 5 TIMES the PRIZE shown for that symbol! Scratch the PLAY AREA to reveal coins. If coins add to over $1.00, win PRIZE shown in the PRIZE BOX! Get three like numbers in the same row, column or diagonal line and win PRIZE shown. Get three "2" symbols in the same row, column or diagonal line and win TRIPLE the PRIZE shownl! Get 3 like symbols in a GAME, win PRIZE shown for that GAME. Get a "DOUBLE CHERRY" symbol in a GAME, win DOUBLE the PRIZE shown for that GAME! Match any of YOUR NUMBERS to the WINNING NUMBER, win PRIZE shown for that number. 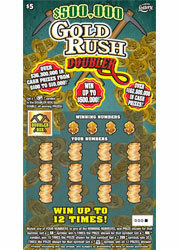 Get a "CA$H" symbol, win DOUBLE the PRIZE shown for that symbol! Get a "MONEYBAG" symbol, win all 5 PRIZES shown! Match any of YOUR NUMBERS to the WINNING NUMBER, win PRIZE shown for that number. Get a "5X" symbol, win 5 TIMES the PRIZE shown for that symbol! Get a "MONEYBAG" symbol, win all 4 PRIZES shown! Each time you get the YOUR MONEY NUMBER in any GAME, win PRIZE shown for that GAME. Get a "$$" symbol in any GAME, win DOUBLE the PRIZE shown for that GAME. Each GAME plays seperately. Match any of YOUR NUMBERS to either of the WINNING NUMBERS, win PRIZE shown for that number. 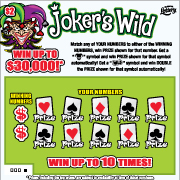 Get a "JOKER" symbol and win PRIZE shown for that symbol automatically! Get a "WILD" symbol and win DOUBLE the PRIZE shown for that symbol automatically! Match any of YOUR NUMBERS to either of the WINNING NUMBERS, win PRIZE shown for that number. 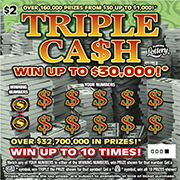 Get a "BANKROLL" symbol, win TRIPLE the PRIZE shown for that symbol! Get a "MONEYBAG" symbol, win all 10 PRIZES shown! Match any of YOUR NUMBERS to either of the WINNING NUMBERS, win PRIZE shown for that number. Get a "5X" symbol, win 5 TIMES the PRIZE shown for that symbol! Get a "10X" symbol, win 10 TIMES the PRIZE shown for that symbol! Get a "MONEYBAG" symbol, win all 10 PRIZES shown! Match any of YOUR NUMBERS to either of the WINNING NUMBERS, win PRIZE shown for that number. Get a "HAT" symbol, win PRIZE shown for that symbol automatically! 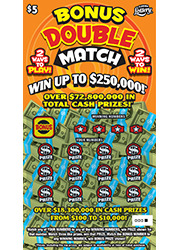 Get a "STACK OF BILLS" symbol, win DOUBLE the PRIZE shown for that symbol! 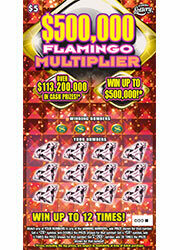 Match any of YOUR NUMBERS or the BONUS NUMBER to either of the WINNING NUMBERS, win PRIZE shown for that number. Get a "SNOWFLAKE" symbol, win PRIZE shown for that symbol automatically! Get an "ORNAMENT" symbol, win DOUBLE the PRIZE shown for that symbol! Match any of YOUR NUMBERS to either of the WINNING NUMBERS, win PRIZE shown for that number. Get a "BILL" symbol, win PRIZE shown for that symbol automatically! Get a "$50 BURST" symbol, win $50 automatically! Get a "WIN ALL" symbol, win all 10 PRIZES shown! Match any of YOUR NUMBERS to either of the WINNING NUMBERS, win PRIZE shown for that number. Get a "MR. MONOPOLY" symbol, win DOUBLE the PRIZE shown for that symbol! Get a "GO" symbol, win $200 automatically! Get a "MONEYBAG" symbol, win all 10 PRIZES shown! Scratch the PLAY AREA. 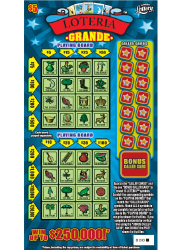 Count the number of any "MONEYBAG" symbols in the PLAY AREA and win the corresponding PRIZE in the PRIZE LEGEND. Only the highest PRIZE is paid. Match any of YOUR NUMBERS to either WINNING NUMBER, win PRIZEshown for that number. Get a "SEVEN" symbol, win TRIPLE the PRIZE shown for that symbol! Get a "MONEYBAG" symbol, win all 10 PRIZES shown! Match any of YOUR NUMBERS to either of the WINNING NUMBERS, win PRIZE shown for that number. Get a "LUCKY" symbol, win PRIZE shown for that symbol automatically! Get a "$100 BURST" symbol, win $100 automatically! Get a "MONEYBAG" symbol, win all 10 PRIZES shown! Match any of YOUR NUMBERS to either of the WINNING NUMBERS, win PRIZE shown for that number. Get a "2X" symbol, win DOUBLE the PRIZE shown for that symbol! Get a "5X" symbol, win 5 TIMES the PRIZE shown for that symbol! Get a "10X" symbol, win 10 TIMES the PRIZE shown for that symbol! Match any of YOUR NUMBERS to either of the WINNING NUMBERS, win PRIZE shown for that number. Get a "DIAMOND" symbol, win PRIZE shown for that symbol automatically! Get a "STACK OF BILLS" symbol, win DOUBLE the PRIZE shown for that symbol! 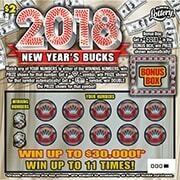 BONUS BOX: Get a "2018" in the BONUS BOX, win PRIZE shown automatically! Match any of YOUR NUMBERS to either of the WINNING NUMBERS, win PRIZE shown for that number. Get a "BILL" symbol, win PRIZE shown for that symbol automatically! 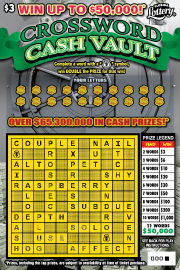 Get a "MONEYROLL" symbol, win $50 automatically! Get a "MONEYBAG" symbol, win all 10 PRIZES shown! Match any of YOUR NUMBERS to either of the WINNING NUMBERS, win PRIZE shown for that number. Get a "CA$H" symbol, win PRIZE shown for that symbol automatically! 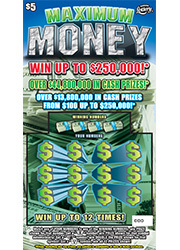 Get a "$$" symbol, win DOUBLE the PRIZE shown for that symbol! Get a MONEYBAG symbol, win all 10 PRIZES shown! Match any of YOUR NUMBERS to eitherWINNING NUMBER, win PRIZE shown for that number. Get a "2X" symbol, win DOUBLE the PRIZE shown for that symbol! Get a "MONEYBAG" symbol, win all 10 PRIZES shown! Match any of YOUR NUMBERS to either of the WINNING NUMBERS, win PRIZE shown for that number. Get a "STACK OF BILLS" symbol, win DOUBLE the PRIZE shown for that symbol! Get a "MONEYBAG" symbol, win all 10 PRIZES shown! Scratch the "CALLER CARDS" to reveal 14 LOTERIA® symbols. 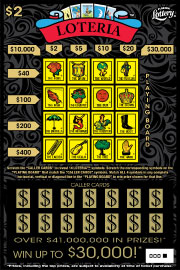 Scratch the corresponding symbols on the "PLAYING BOARD" that match the "CALLER CARDS" symbols. Match ALL 4 symbols in any complete horizontal, vertical or diagonal line in the "PLAYING BOARD" to win prize shown for that line. Match any of YOUR NUMBERS to any of the WINNING NUMBERS, win PRIZE shown for that number. Get a "5X" symbol, win 5 TIMES the PRIZE shown for that symbol! Get a "10X" symbol, win 10 TIMES the PRIZE shown for that symbol! Get a "MONEYBAG" symbol, win all 10 PRIZES shown! 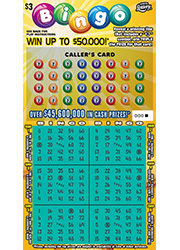 Match any of YOUR NUMBERS to either of the WINNING NUMBERS, win PRIZE shown for that number! 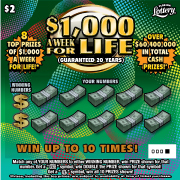 Get a "ROLL OF BILLS" symbol, win DOUBLE the PRIZE shown for that symbol. Get a "MONEYBAG" symbol, win all 10 PRIZES shown! Match any of YOUR NUMBERS to either WINNING NUMBER, win PRIZE shown for that number. Get a "2X" symbol, win DOUBLE the PRIZE shown for that symbol! Get a "5X" symbol, win 5 TIMES the PRIZE shown for that symbol! 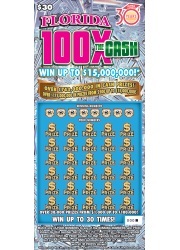 Get a "10X" symbol, win "10 TIMES" the PRIZE shown for that symbol! Match any of YOUR NUMBERS to either of the WINNING NUMBERS, win PRIZE shown for that number. Get a "2X" symbol, win DOUBLE the PRIZE shown for that symbol! Get a "5X" symbol, win 5 TIMES the PRIZE shown for that symbol! Get a "10X" symbol, win "10 TIMES" the PRIZE shown for that symbol! Get a "MONEYBAG" symbol, win all 10 PRIZES shown! 1. Scratch the YOUR LETTERS box to reveal your twenty (20) letters. 2. Scratch the letters in the CROSSWORD PUZZLE that match any of YOUR LETTERS. The letters in the CROSSWORD PUZZLE will turn white when scratched. 3. If you have completely matched two (2) or more words in the CROSSWORD PUZZLE, you win the corresponding prize in the PRIZE LEGEND for the total number of words matched. A "MONEYBAG" symbol functions as a substitute for one letter in a word of which it is a part. 4. If one of the winning matched words contains a "MONEY BAG" symbol, the prize amount doubles. A. A "word" must contain at least three (3) letters. B. A "word" cannot be formed by linking letters diagonally or by reading the letters from the bottom to top or right to left. C. Letters combined to form a "word" must appear in an unbroken horizontal or vertical string of letters in the CROSSWORD PUZZLE. An unbroken string of letters: (a) cannot be interrupted by a blank space and (b) must contain every single letter square between two (2) blank spaces or the edge and a blank space. D. Every single letter in the unbroken string must: (a) be revealed in YOUR LETTERS and (b) be included to form a "word". E. The possible complete words for this ticket are shown on the CROSSWORD PUZZLE. Each possible complete word consists of three (3) or more letters and occupies an entire word space. You must match all of the letters in a possible complete word in order to complete the word. If the letters revealed form two (2) or more complete words in the CROSSWORD PUZZLE, each of which occupies a complete word space, you win the prize shown in the PRIZE LEGEND for forming that number of words. Only highest prize won paid per ticket. 1. Scratch the YOUR SCRABBLE LETTERS tiles to reveal your 20 letters. 2. Scratch the letters on the SCRABBLE BOARD that match any of YOUR SCRABBLE LETTERS. The letters on the SCRABBLE BOARD will turn yellow when scratched. 3. If you have completely matched two (2) or more words on the SCRABBLE BOARD, you win the corresponding prize in the PRIZE LEGEND for the total number of words matched. C. Letters combined to form a "word" must appear in an unbroken horizontal or vertical string of letters on the SCRABBLE BOARD. An unbroken string of letters: (a) cannot be interrupted by a blank space and (b) must contain every single letter square between two (2) blank spaces or the edge and a blank space. D. Every single letter in the unbroken string must: (a) be revealed in YOUR SCRABBLE LETTERS and (b) be included to form a "word". E. The possible complete words for this ticket are shown on the SCRABBLE BOARD. Each possible complete word consists of three (3) or more letters and occupies an entire word space. You must match all of the letters in a possible complete word in order to complete the word. If the letters revealed form two (2) or more complete words on the SCRABBLE BOARD, each of which occupies a complete word space, you win the prize shown in the PRIZE LEGEND for forming that number of words. If you win on the SCRABBLE BOARD and any one of the completed words has a BLUE square in the word, win DOUBLE the prize indicated in the PRIZE LEGEND. If you win on the SCRABBLE BOARD and any one of the completed words has a RED square in the word, win TRIPLE the prize indicated in the PRIZE LEGEND. Only highest prize won paid per ticket. - an X(consisting of eight numbers + "FREE"), you win the associated prize shown for that card. A FREE space will appear in the center of each player's card and can substitute as a number in a pattern of which it is a part. A "BANKROLL" symbol is a FREE spot and can substitute as a number. If it completes a winning line pattern, win TRIPLE the line prize for that card. - an X(consisting of eight numbers + FREE), you win the associated prize shown for that card. A "$" symbol is a FREE spot and can substitute as a number. If it completes a winning line pattern, win TRIPLE the line prize for that card. 1. Scratch the YOUR LETTERS box to reveal your 20 letters. 3. If you have completely matched two (2) or more words in the CROSSWORD PUZZLE, you win the corresponding prize in the PRIZE LEGEND for the total number of words matched. An unbroken string of letters: (a) cannot be interrupted by a blank space and (b) must contain every single letter square between two blank spaces or the edge and a blank space. F. The possible complete words for this ticket are shown on the CROSSWORD PUZZLE. Each possible complete word consists of three (3) or more letters and occupies an entire word space. You must match all of the letters in a possible complete word in order to complete the word. If the letters revealed form two (2) or more complete words in the CROSSWORD PUZZLE, each of which occupies a complete word space, you win the prize shown in the PRIZE LEGEND for forming that number of words. If YOUR LETTERS completely match the letters in the BONUS WORD win PRIZE in the PRIZE BOX! BONUS WORD is played independently and cannot be used in other GAME. Match any of YOUR NUMBERS to any of the WINNING NUMBERS, win PRIZE shown for that number. Get a "MONEYBAG" symbol, win $100 automatically! Get a "5X"symbol, win 5 TIMES the PRIZE shown for that symbol! 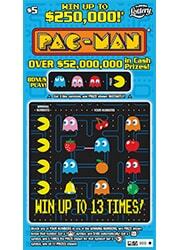 Get a "PAC-MAN" symbol, win all 12 PRIZES shown! Reveal a YOUR NUMBER ending in 5, win corresponding PRIZE shown.Reveal a "MONEYBAG" symbol, win $50 automatically! Reveal a "5X" symbol, win 5 TIMES the PRIZE shown for that symbol! POWER $25 BONUS : Reveal a "POWER" symbol, win $25 automatically. 1. Scratch the YOUR LETTERS box to reveal your eighteen (18) letters. 3. If you have completely matched three (3) or more words in the CROSSWORD PUZZLE, you win the corresponding prize in the PRIZE LEGEND for the total number of words matched. C. Letters combined to form a "word" must appear in an unbroken horizontal or vertical string of letters in the CROSSWORD PUZZLE. An unbroken string of letters: (a) cannot be interrupted by a blank space and (b) must contain every single letter square between two (2) blank spaces. D. Every single letter in the unbroken string must: (a) be revealed in YOUR LETTERS and (b) be included to form a "word". 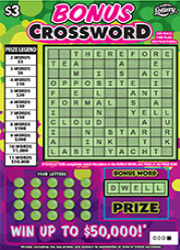 The possible complete words for this ticket are shown on the CROSSWORD PUZZLE. Each possible complete word consists of three (3) or more letters and occupies an entire word space. You must match all of the letters in a possible complete word in order to complete the word. HOW TO WIN CROSSWORD: If the letters revealed form three (3) or more complete words in the CROSSWORD PUZZLE, each of which occupies a complete word space, you win the prize shown in the PRIZE LEGEND for forming that number of words. 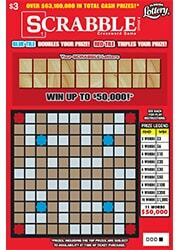 For CROSSWORD game play, only the highest prize won is paid per ticket. 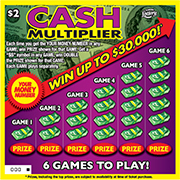 HOW TO PLAY and WIN EXTRA PLAY: Match any of YOUR NUMBERS to either of the WINNING NUMBERS, win PRIZE shown for that number. Get a "BANKROLL" symbol, win PRIZE shown for that symbol automatically! Get a "2X" symbol, win DOUBLE the PRIZE shown for that symbol! Get a "MONEYBAG" symbol, win all 10 PRIZES shown! Get a "HORSESHOE" symbol, win PRIZE shown for that symbol automatically. Get a "SHAMROCK" symbol, win 5X the PRIZE shown for that symbol! 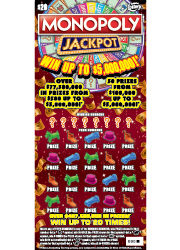 Get a "POT OF GOLD" symbol, win all 12 PRIZES shown! Match any of YOUR NUMBERS to any of the WINNING NUMBERS, win PRIZE shown for that number. Get a "5X" symbol, win 5 TIMES the PRIZE shown for that symbol! Get a "10X" symbol, win 10 TIMES the PRIZE shown for that symbol! Get a "GOLDBAR" symbol, win $500 automatically! Get a "MONEYBAG" symbol, win all 12 PRIZES shown! Match any of YOUR NUMBERS to any of the WINNING NUMBERS, win PRIZE shown for that number. Get a "CASH" symbol, win PRIZE shown for that symbol automatically! Get a "2X" symbol, win DOUBLE the PRIZE shown for that symbol! Get a "10X" symbol, win 10 TIMES the PRIZE shown for that symbol! Get a "BLAST" symbol, win all 12 PRIZES shown! 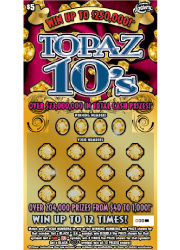 Match any of YOUR NUMBERS or the BONUS NUMBER to any of the WINNING NUMBERS, win PRIZE shown for that number. Get a "SNOWFLAKE" symbol, win PRIZE shown for that symbol automatically! Get an "ORNAMENT" symbol, win DOUBLE the PRIZE shown for that symbol! Match any of YOUR NUMBERS to any of the WINNING NUMBERS, win PRIZE shown for that number. Get a "BILL" symbol, win PRIZE shown for that symbol automatically! Get a "COIN" symbol, win DOUBLE the PRIZE shown for that symbol! Get a "STACK OF COINS" symbol, win "10 TIMES" the "PRIZE" shown for that symbol! 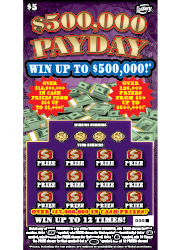 Get a "PAYDAY" symbol, win all 12 PRIZES shown! Match any of YOUR NUMBERS to any of the WINNING NUMBERS, win PRIZE shown for that number. Get a "STACK OF COINS" symbol, win PRIZE shown for that symbol automatically! Get a "5X" symbol, win 5 TIMES the PRIZE shown for that symbol! 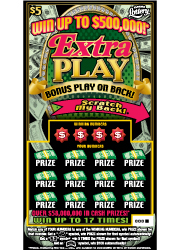 Get an "EXTRA" symbol, win $100 automatically! 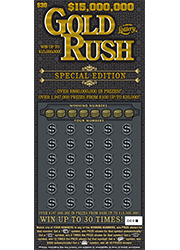 BONUS AREA PLAY INSTRUCTIONS: Get a "$$" symbol, win PRIZE shown for that symbol automatically! Match any of YOUR NUMBERS to any of the WINNING NUMBERS, win PRIZE shown for that number. Get a "GO" symbol, win $200 automatically! Get a "CHEST" symbol, win 5 TIMES the PRIZE shown for that symbol! Get a "MONEYBAG" symbol, win all 12 PRIZES shown! WHAT'S UP FOR BID:If YOUR BID matches the ACTUAL RETAIL PRICE in a GAME, win PRIZE shown for that GAME. Each GAME (across) plays separately. GRAND $ GAME™: If any of your GROCERY ITEMS have a lower price than the TARGET PRICE, win PRIZE shown for that item. BONUS ROUND: Reveal a "100" symbol in the BONUS ROUND, win $100 automatically! 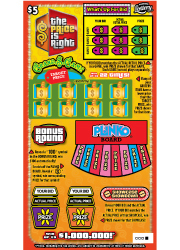 PLINKO BOARD®: Scratch off the PLINKO BOARD. Reveal a "CIRCLE $" symbol, win corresponding PRIZE for that symbol! SHOWCASE SHOWDOWN:Reveal YOUR BID and the ACTUAL PRICE. If YOUR BID matches the ACTUAL PRICE of that SHOWCASE, win PRIZE shown for that SHOWCASE! *Top prize shown reflects annual payment option of 25 equal annual installments of $40,000. Match any of YOUR NUMBERS to any of the WINNING NUMBERS, win PRIZE shown for that number. Get a "STACK OF COINS" symbol, win PRIZE shown for that symbol automatically! Get a "2X" symbol, win DOUBLE the PRIZE shown for that symbol! Get a "MONEYBAG" symbol, win all 12 PRIZES shown! Match any of YOUR NUMBERS to any of the WINNING NUMBERS, win PRIZE shown for that number. Get a "2X" symbol, win DOUBLE the PRIZE shown for that symbol! Get a "5X" symbol, win 5 TIMES the PRIZE shown for that symbol! Get a "10X" symbol, win 10 TIMES the PRIZE shown for that symbol! Get a "20X" symbol, win 20 TIMES the PRIZE shown for that symbol! Match any of YOUR NUMBERS to any of the WINNING NUMBERS, win PRIZE shown for that number. 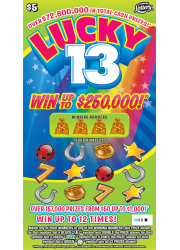 Get a BLACK "13" symbol, win DOUBLE the PRIZE shown for that symbol! 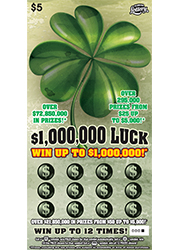 Get a GREEN "LUCKY" symbol, win 5 TIMES the PRIZE shown for that symbol! Get a GREEN"CLOVER" symbol, win all 12 PRIZES shown! Match any of YOUR NUMBERS to any of the WINNING NUMBERS, win PRIZE shown for that number. Get a BLACK "10" symbol, win DOUBLE the PRIZE shown for that symbol! Get a RED "10" symbol, win 5 TIMES the PRIZE shown for that symbol! Get a BLACK "GEM" symbol, win all 12 PRIZES shown! Match any of YOUR NUMBERS to any of the WINNING NUMBERS, win PRIZE shown for that number. Match three like prizes, win that PRIZE. 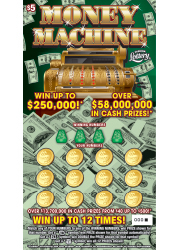 Match the BONUS NUMBER to any WINNING NUMBER, win BONUS PRIZE shown! 2. Scratch the letters in GAME #1 and GAME #2 that match any of YOUR LETTERS. The letters in GAME #1 and GAME #2 will turn white when scratched. 3. If you have completely matched three (3) or more words in GAME # 1, you win the corresponding prize in the GAME #1 PRIZE LEGEND for the total number of words matched in GAME # 1. If you have completely matched three (3) or more words in GAME # 2, you win the corresponding prize in the GAME #2 PRIZE LEGEND for the total number of words matched in GAME # 2. Players can win in both games. E. GAME 1 and GAME 2 are played independently. Words in one game cannot be used in the other game. F. The possible complete words for this ticket are shown on each CROSSWORD PUZZLE. Each possible complete word consists of three (3) or more letters and occupies an entire word space. You must match all of the letters in a possible complete word in order to complete the word. Complete a word with a "7" symbol, win DOUBLE the PRIZE won for that GAME! 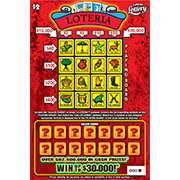 Scratch the "CALLER CARDS" and the one BONUS CALLER CARD" to reveal 15 LOTERIA® symbols. Scratch the corresponding symbols on the "PLAYING BOARDS" that match the "CALLER CARDS" symbols. 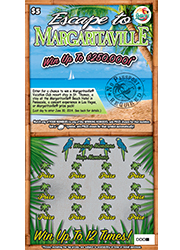 Match ALL 4 symbols in any complete horizontal or vertical line in the "PLAYING BOARD" to win prize shown for that line. If you complete a horizontal or vertical line using the BONUS CALLER CARD", win DOUBLE the PRIZE shown for that line. Match any of YOUR NUMBERS to any of the WINNING NUMBERS, win PRIZE shown for that number. 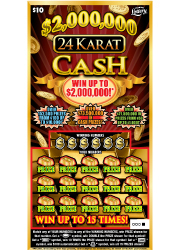 Get a "CASH" symbol, win PRIZE shown for that symbol automatically! Get a "2X" symbol, win DOUBLE the PRIZE shown for that symbol! Get a "10X" symbol, win 10 TIMES the PRIZE shown for that symbol! Get a "MONEYBAG" symbol, win all 12 PRIZES shown! Match any of YOUR NUMBERS to any of the WINNING NUMBERS, win PRIZE shown for that number. Get a "5X" symbol, win 5 TIMES the PRIZE shown for that symbol! Get a "10X" symbol, win 10 TIMES the PRIZE shown for that symbol! Get a "20X" symbol, win 20 TIMES the PRIZE shown for that symbol! Get a "MONEYBAG" symbol, win all 12 PRIZES shown! Match any of YOUR NUMBERS to any of the WINNING NUMBERS, win PRIZE shown for that number. Get a "STACK OF COINS" symbol, win PRIZE shown for that symbol automatically! Get a "5X" symbol, win 5 TIMES the PRIZE shown for that symbol! 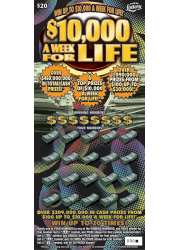 Get a "$100 BILL" symbol, win $100 automatically! Get a "MONEYBAG" symbol, win all 12 PRIZES shown! Match any of YOUR NUMBERS to any of the WINNING NUMBERS, win PRIZE shown for that number. Get a "COIN" symbol, win PRIZE shown for that symbol automatically! Get a "STACK OF COINS" symbol, win DOUBLE the PRIZE shown for that symbol! Get a "MONEYBAG" symbol, win all 12 PRIZES shown! Match any of YOUR NUMBERS to any of the WINNING NUMBERS, win PRIZE shown for that number. Get a "WIN" symbol, win PRIZE shown for that symbol automatically! Get a "2X"symbol, win DOUBLE the PRIZE shown for that symbol! Get a "10X" symbol, win "10 TIMES" the PRIZE shown for that symbol! Get a "MONEYBAG" symbol, win all 12 PRIZES shown! 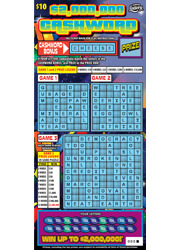 Match any of YOUR NUMBERS to any of the WINNING NUMBERS, win PRIZE shown for that number. Get a "2X" symbol, win DOUBLE the PRIZE shown for that symbol! Get a "5X" symbol, win 5 TIMES the PRIZE shown for that symbol! 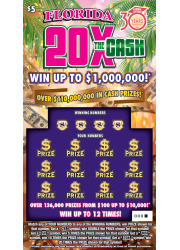 Get a "20X" symbol, win "20 TIMES" the PRIZE shown for that symbol! Match any of YOUR NUMBERS to any of the WINNING NUMBERS, win PRIZE shown for that number. Get a "2X" symbol, win DOUBLE the PRIZE shown for that symbol! Get a "5X" symbol, win 5 TIMES the PRIZE shown for that symbol! Get a "20X" symbol, win "20 TIMES" the PRIZE shown for that symbol! Get a "MONEYBAG" symbol, win all 12 PRIZES shown! 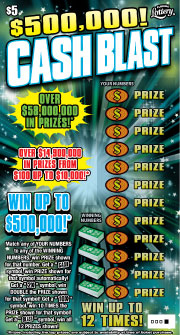 Match any of YOUR NUMBERS to any of the WINNING NUMBERS, win PRIZE show for that number. Get a "COCONUT" symbol, win PRIZE shown for that symbol automatically! Match any of YOUR NUMBERS to any of the WINNING NUMBERS, win PRIZE shown for that number. Get a "5X" symbol, win 5 TIMES the PRIZE shown for that symbol! Get a "10X"symbol, win 10 TIMES the PRIZE shown for that symbol! Get a "20X" symbol, win "20 TIMES" the PRIZE shown for that symbol! 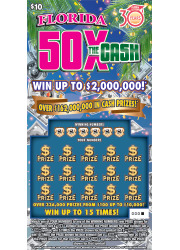 Get a "50X" symbol, win "50 TIMES" the PRIZE shown for that symbol! BONUS SPINS: Reveal 1 vowel letter (A, E, I, O, U) and win $100 instantly! Reveal 2 vowel letters, win $200 instantly! $50, $100 AND $500 BLOWOUT! 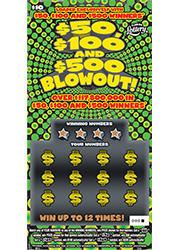 #1418 – $50, $100 AND $500 BLOWOUT! Match any of YOUR NUMBERS to any of the WINNING NUMBERS, win PRIZE shown for that number. Get a "STACK OF COINS" symbol, win PRIZE shown for that symbol automatically! Get a "$50" symbol, win $50 automatically! Get a "$100" symbol, win $100 automatically! Get a "$500" symbol, win $500 automatically! Match any of YOUR NUMBERS to any of the WINNING NUMBERS, win PRIZE shown for that number. Get a "5X" symbol, win 5 TIMES the PRIZE shown for that symbol! Get a "10X" symbol, win 10 TIMES the PRIZE shown for that symbol! 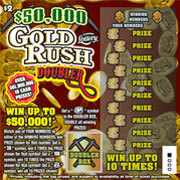 Get a "GOLDBAR" symbol, win $500 automatically! Get a "MONEYBAG" symbol, win all 15 PRIZES shown! 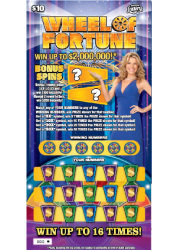 Match any of YOUR NUMBERS or the BONUS NUMBER to any of the WINNING NUMBERS, win PRIZE shown for that number. Get a "SNOWFLAKE" symbol, win PRIZE shown for that symbol automatically! Get a "GINGERBREAD MAN" symbol, win $100 automatically! Get an "ORNAMENT" symbol, win DOUBLE the PRIZE shown for that symbol! Match any of YOUR NUMBERS to any of the WINNING NUMBERS, win PRIZE shown for that number. Get a "MR. MONOPOLY" symbol, win DOUBLE the PRIZE shown for that symbol! Get a "GO" symbol, win $200 automatically! Get a "CHEST" symbol, win 10 TIMES the PRIZE shown for that symbol! Get a "MONEYBAG" symbol, win all 15 PRIZES shown! Match any of YOUR NUMBERS to any of the WINNING NUMBERS, win PRIZE shown for that number. Get a "COIN" symbol, win DOUBLE the PRIZE shown for that symbol! Get a "10X" symbol, win 10 TIMES the PRIZE shown for that symbol! Get a "GOLD BAR" symbol, win $100 automatically! Get a "MONEYBAG" symbol, win all 15 PRIZES shown! *Top prize shown reflects annual payment option of 25 equal annual installments of $80,000. Match any of YOUR NUMBERS to any of the WINNING NUMBERS, win PRIZE shown for that number. Get a "2X" symbol, win DOUBLE the PRIZE shown for that symbol! Get a "5X" symbol, win 5 TIMES the PRIZE shown for that symbol! Get a "10X" symbol, win 10 TIMES the PRIZE shown for that symbol! Get a "20X" symbol, win 20 TIMES the PRIZE shown for that symbol! Get a "50X" symbol, win 50 TIMES the PRIZE shown for that symbol! 2. Scratch the letters in GAME #1 , GAME #2 and GAME #3 that match any of YOUR LETTERS. The letters in GAME #1 , GAME #2 and GAME #3 will turn white when scratched. 3. If you have completely matched three (3) or more words in GAME # 1, you win the corresponding prize in the GAME #1 PRIZE LEGEND for the total number of words matched in GAME # 1. If you have completely matched three (3) or more words in GAME # 2, you win the corresponding prize in the GAME #2 PRIZE LEGEND for the total number of words matched in GAME # 2. If you have completely matched three (3) or more words in GAME # 3, you win the corresponding prize in the GAME #3 PRIZE LEGEND for the total number of words matched in GAME # 3. Players can win in all three games. E. GAME 1, GAME 2 and GAME 3 are played independently. Words in one GAME cannot be used in the other GAME. CASHWORD BONUS: If YOUR LETTERS completely match the letters in the CASHWORD BONUS, win PRIZE shown in the PRIZE BOX! CASHWORD BONUS is played independently and cannot be used in other GAMES. Match any of YOUR NUMBERS to any of the WINNING NUMBERS, win PRIZE shown for that number. Get a "5X" symbol, win 5 TIMES the PRIZE shown for that symbol! Get a "10X" symbol, win 10 TIMES the PRIZE shown for that symbol! Get a "20X" symbol, win 20 TIMES the PRIZE shown for that symbol! 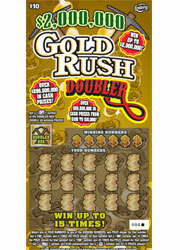 Get a "GOLDBAR" symbol, win $100 automatically! Get a "MONEYBAG" symbol, win all 15 PRIZES shown! Match any of YOUR NUMBERS to any of the WINNING NUMBERS, win PRIZE shown for that number. Get a "5X" symbol, win 5 TIMES the PRIZE shown for that symbol! Get a "10X" symbol, win 10 TIMES the PRIZE shown for that symbol! 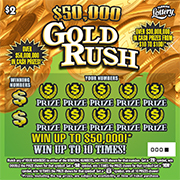 Get a "GOLDBAR" symbol, win $500 automatically! Get a "MONEYBAG" symbol, win all 20 PRIZES shown! Match any of YOUR NUMBERS to any of the WINNING NUMBERS, win PRIZE shown for that number. Get a "MR. MONOPOLY" symbol, win DOUBLE the PRIZE shown for that symbol! Get a "CHEST" symbol, win 5 TIMES the PRIZE shown for that symbol! Get a "GO" symbol, win $200 automatically! Get a "FREE PARKING" symbol, win 10 TIMES the PRIZE shown for that symbol! Get a "MONEYBAG" symbol, win all 20 PRIZES shown! Match any of YOUR NUMBERS to any of the WINNING NUMBERS, win PRIZE shown for that number. Get a "COIN" symbol, win PRIZE shown for that symbol automatically! Get a "2X" symbol, win DOUBLE the PRIZE shown for that symbol! Get a "10X" symbol, win 10 TIMES the PRIZE shown for that symbol. Get a "MONEYBAG" symbol, win all 20 PRIZES shown! Match any of YOUR NUMBERS to any of the WINNING NUMBERS, win PRIZE shown for that number. Get a "STAR" symbol and win $100 automatically! Match any of YOUR NUMBERS to any of the WINNING NUMBERS, win PRIZE shown for that number. Get a "STACK OF COINS" symbol, win PRIZE shown for that symbol automatically! Get a "5X" symbol, win 5 TIMES the PRIZE shown for that symbol! Get a "10X" symbol, win 10 TIMES the PRIZE shown for that symbol! 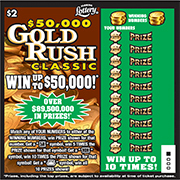 Get a "GOLDBAR" symbol, win $500 automatically! Get a "MONEYBAG" symbol, win all 30 PRIZES shown! 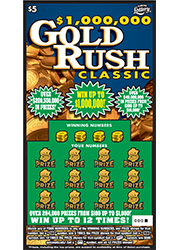 Enter your non-winning GOLD RUSH CLASSIC and $15,000,000 GOLD RUSH SPECIAL EDITION Scratch-Off tickets in the Gold Rush Classic Second Chance Promotion. 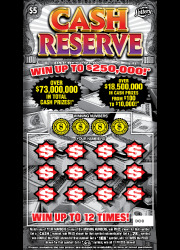 A total of 222 winners will win $600,000 in second chance cash prizes! 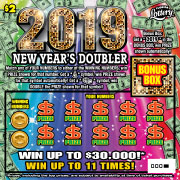 Six drawings will be held between January 30, 2019 and April 10, 2019, where one player in each drawing will win $30,000 in cash, two players will win $10,000 in cash, four players will win $5,000 in cash and thirty players will win $1,000 in cash prizes. 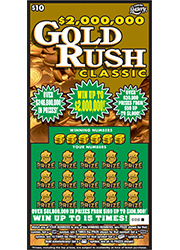 Receive up to 30 entries per ticket for a chance to win cash prizes of up to $30,000 by entering your non-winning $15,000,000 GOLD RUSH SPECIAL EDITION tickets into the Gold Rush Classic Second Chance Promotion. Number of entries differs by game. Match any of YOUR NUMBERS to any of the WINNING NUMBERS, win PRIZE shown for that number. 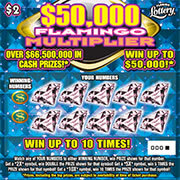 Get a "2X", "5X", "10X", "20X", "50X", or "100X" symbol and MULTIPLY the PRIZE shown for that symbol by the multiplier ! Get a "COIN" symbol, win $500 automatically! 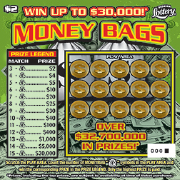 Get a "MONEYBAG" symbol, win all 30 PRIZES shown! 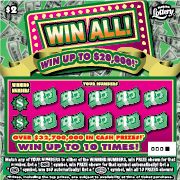 © 2019 Florida Lottery, All Rights Reserved. Must be 18 or older to play. Be alert for lottery scams.